If you’re passionate about football, Solent University’s industry-leading football studies degree can help provide you with the skills you’ll need to thrive in a variety of football roles. Past graduates are now employed in a range of clubs and organisations at all levels of the game. Solent University has been at the forefront of football education for nearly two decades and our football studies degree has emerged as the leading supplier of graduates to the football industry. Graduates have gone on to careers at Premier League clubs including Southampton, Chelsea, Arsenal, Manchester United, Manchester City and Tottenham Hotspur. This degree provides students with comprehensive knowledge and real-world experience of the football industry. Students have the opportunity to study a range of contemporary themes, as well as tailor their study to areas of specific interest within football. Endorsed by the League Managers Association, the Professional Football Coaches Association and Kick It Out, the course offers excellent work placement opportunities with professional clubs and organisations. Students are able to benefit from the opportunity to tap into the University’s extensive network of contacts in the game. Regular lectures from guest speakers - including former Premier League and international players, managers, academy directors, leading club chairmen, media professionals, match officials and England national team staff - enable students to learn from and interact with professionals who have first-hand, high-level experience within the game. Solent University is recommended as a ‘leader in football-related academic study’ by The Times Good University Guide. This football studies programme is open to students from a wide range of academic backgrounds – football foundation year graduates will receive direct entry. Candidates should be passionate about football and aspiring to a career within a professional club or sporting organisation. Students must purchase compulsory kit/clothing. This is at a cost of approximately £105. Nacsport Licence for performance analysis software. Students will develop a range of transferable skills including presentation, communication, teamwork, IT and numeracy, organising people, time management and research. The course is assessed using a combination of scouting reports, essays, group presentations, fieldwork, practical planning and delivery, and written examinations. The course is taught through a combination of lectures, seminars and tutorials, both in groups and individually. Practical sessions are delivered at the University’s multi-million-pound Test Park football centre. In the 2013/14 season the English Premier League generated revenue of almost £4 billion, more than any other European league. With revenues from the five major European leagues rising by 15% this year alone (Deloitte, 2015), this large and growing industry offers a wealth of opportunities suitable for properly prepared graduates. The academic staff on the football studies degree possess a wealth of knowledge and experience at various levels of the game. They have coached at Premier League and Football League clubs, conducted major research reviews that have changed Premier League and Football League rules and regulations, won European acclaim for their football development work from UEFA and helped national teams prepare for World Cup Finals. If you're a non-UK student studying at an EU university, the Erasmus programme gives you the chance to come to the UK and study football studies units at Solent for between three months and a full academic year. Practical sessions are delivered at Solent’s multi-million-pound Test Park football centre, which boasts a full-size all-weather 3G pitch, an FA Step 5 football arena and built-in teaching space. Students also have access to AnalysisPro/Nacsport video and performance analysis equipment and software. Solent University is home to the Lawrie McMenemy Centre for Football Research – a world-class research and consultancy centre and the course is endorsed by the League Managers Association, the Professional Football Coaches Association and Kick It Out. You’ll be well placed for a wide range of roles in football, whether you’re interested in development, coaching, scouting, performance analysis or research/education. My time at Solent gave me various opportunities to gain internships in the professional game and these experiences have helped me to secure my new role at St George’s Park. Every experience I had at Solent was valuable. The football studies degree at Solent prepared me for work within the football industry, ensuring I had a skill set appropriate for dealing with the industry’s demands. The football studies staff go above and beyond to deliver a great student experience. The football studies degree not only provided an insight into the unique industry that is football, but also gave me the opportunity to gain hands-on experience working in a competitive environment. Along with consistent feedback and tutor guidance, the core theoretical elements aligned with the practical side of this course prepared me thoroughly for this position. I know without the experience and knowledge gained from the football studies course I wouldn't have even had a shot at this job. I gained a better knowledge of what was needed to work within a professional football club and a wider understanding of what I wanted to do after I graduated. Every day within the job I use skills and qualities that I gained from Solent University. The football studies degree covers such a wide variety of topics that it prepares you exceptionally well for a career in the world of football. The football studies degree gave me exposure to a range of opportunities. From internship connections to guest lectures, the course helped me to achieve a better understanding of what working within football entailed. It drove me to work hard to develop. The academic staff on the Football Studies degree possess a wealth of knowledge and experience at all levels of the game. They have coached at Premier League and Football League clubs, conducted major research reviews that have changed Premier League and Football League rules and regulations, won European acclaim for their football development work from UEFA and helped national teams prepare for World Cup Finals. The course benefits from extensive industry links which include a longstanding relationship with Southampton FC. The University has provided administrative education for FIFA, the Football Association, the Premier League, the Football League, the Football Conference and more than 60 professional clubs. Gaining practical work experience is at the heart of the course. Students are required to take part in a football leadership programme, working on projects in the local football community. Students are also encouraged to seek optional internship and work-based learning opportunities with professional clubs and organisations. Placement schemes have run in the past with a number of Premier League and Football League clubs, recruiting students from within the University, whilst other students arrange their own placements with support from the course team. The University can also help students to use their coaching skills in the United States and elsewhere during holiday periods. Third-year students studying the Applied Coaching in Football unit are required to be working with a football club – the University can offer students support in getting in touch with local clubs if they are not already working with one. 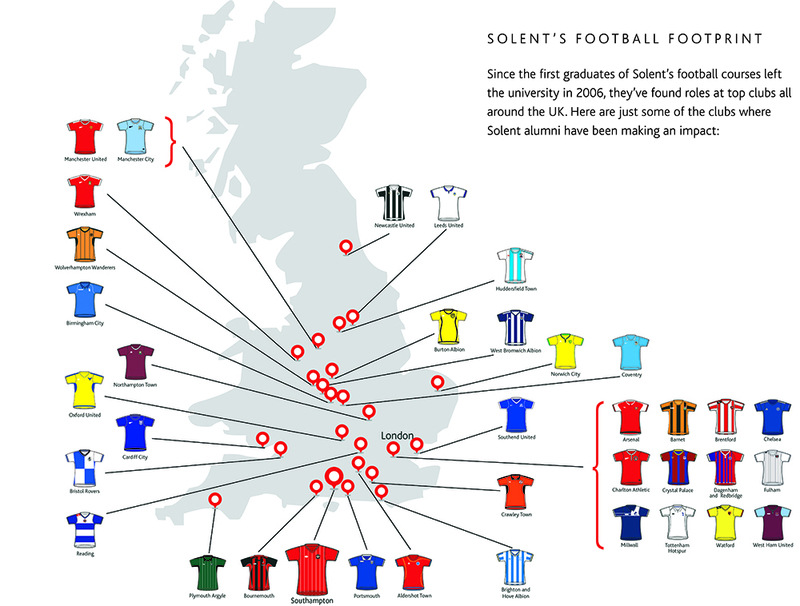 I chose to study at Solent because of its great reputation for the Football Studies course. I also attended an open day and spoke to current students on the course. The overall impression of Solent and the city itself made my choice incredibly easy in the end. The best part of the course was the support, guidance and expertise from the tutors, particularly the coaching staff as coaching was the avenue I wanted to pursue. I currently work for the International Department at the Chelsea FC Foundation. I'm placed in Bangkok, Thailand for 10 out of 12 months in the year delivering a genuine Chelsea FC Soccer School programme in partnership with multiple international schools in the city. As head coach my role is to deliver coaching sessions to multiple participants in different programmes and help develop the business by ensuring CFC standards are met. What is your biggest achievement in your work so far? My biggest achievement is being offered the opportunity to travel on the Chelsea FC first team tour in Singapore. This involved travelling with the Chelsea FC senior first team, delivering sessions to the surrounding community and supporting the fanzones on match-days. What advice would you give to someone just starting this course? Seek opportunities! The degree alone is not enough to secure employment, and the tutors always encouraged me to seek other opportunities to develop myself outside of the degree. For example, coaching courses and part-time coaching/football development roles.